I write at least one post a week. Does that take discipline? Sure. But when I break it down, the hardest part — the part for which I need the discipline — is sitting down to write. I’ll find all sorts of things to distract me from starting. But if I can get myself to start a post, I don’t need much discipline to finish it. This is my experience as well. I spend lots of time noodling over whether or not to sit down and write. I’ll wonder when I’m going to do it, I’ll schedule my weekend morning so that it has writing time. I spend a lot of time doing this…way more than necessary. But once I’ve started I’ve got momentum. It’s the sitting down that’s the hard part…where most of my consternation comes in. I think this is why some of the best thinkers had daily rituals…so they could spend less time planning and more time doing. Bregman’s solution to moments in which to make decisions? “Schedule them. Create an established time to second-guess yourself, a time when you know your commitment won’t be weakened by the temptations of the moment. If you’re going to break the diet, do it when your need for willpower is at its lowest. Decide to decide the next day, maybe after a healthy breakfast or a little exercise, when you know your inclination to stick to your goals will be naturally high. via How (And When) to Motivate Yourself – Peter Bregman – Harvard Business Review. This is exactly the sort of conundrum I was trying to explore in the piece. MySpace, in all its visual glory, is a paradox for designers, who, with their refined aesthetic sensibilities, cannot fathom how people value such decoration. What we’ve learned, I think, is that in some cases giving people the ability to express themselves is more important than the designer’s ability to do so. Or, in other words, the designer’s ability to let people express themselves is often an important goal in social web design. For those interested in tagging, I’m giving a live virtual seminar (webcast) next Thursday (July 27): Users as Information Architects: Is Tagging Right for your Site? This is the second seminar we’ve given at UIE, and we’re really excited by the response and feedback generated by the first. I’m focusing this talk on the idea that tagging might help designers organize huge amounts of information by letting their users do it for them. Heresy! You say. Well, in some places it might turn out that tagging beats IA hands down. In others, a traditional IA still works best. However, if you’ve read The Del.icio.us Lesson, you know that it isn’t as simple as it seems at first glance. So I’ll be talking about the ins and outs of tagging, where it seems to work well, and where it doesn’t work. People find things that work well endearing. That’s the secret. When things work well, we see them in a new light. They become more attractive, more pleasurable, more desirable. Our opinion of them strengthens over time. Our initial reaction, usually a superficial one based solely on looks, is vaporized upon use. If it doesn’t work well, then no matter how impressive your graphics are, it doesn’t matter. (think about all of the graphic design done for American-made cars). If it does work well, however, then we give it even more value than before, we attribute all sorts of things to it that we wouldn’t otherwise. We think it looks great. That its designers are nice people. That the site owners are credible. Etc. Our opinion of all attributes of a design skyrocket if we are happy using it. In the graphic design classes I’ve taken they never told us that. It was all about directing the eye, communicating the product’s message, and showing priority. There was never any talk about how people related to the product we were designing the graphic for. Perhaps I’ve only taken bad graphic design classes, but this still seems to be the general feeling…that graphic design exists in a bubble outside of the success of the product and that people will appreciate graphic design as long as it looks good. Most people, however, don’t give a hoot about graphic design unless the thing works well…first. So, as a graphic designer, make sure that you work on stuff that has the potential to work well! If it does work well your great-looking graphics will get much of the credit. And if your graphics help make it work even better (e.g. if you’re doing interface design), then you deserve the credit. But if you’re working on a project that just can’t work well because of an innate flaw in the product itself then you’re on a sinking ship. Say no to it, and stick to projects on which you can affect the outcome. This secret is why it’s so important to get people using your software/product/service as fast as you can. If any part of it works, people’s perception of it changes and they’ll tell others. Design becomes social. And others, hearing what they say and knowing deep down we find things that work well endearing, are more likely to take the chance and use it themselves. And then, after they like using the product, they’ll go back and notice how nice the graphics are. Question from Me: Why do you think that usability and visual design aren’t often associated with each other? “Well Curt Cloninger once wrote that usability experts are from Mars and graphic designers are from Venus, so it could be that. But truthfully, I think it stems from the fact that many people aren’t versed in what determines how we make sense of what we see. Luke is one of the few people trying to crack this nut. I think, for the sake of design in general, that the bridge between usability and visual design has to be made. Instead of arguing all the time, we need to come up with a common, shared language that we can use to communicate. 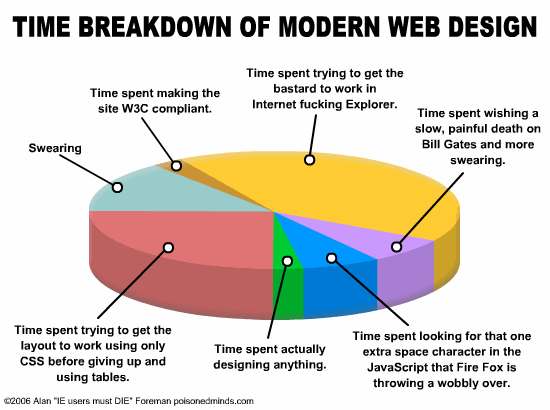 Alan Foreman, after what was undoubtedly a serious scientific inquiry into the matter, has researched and catalogued the time spent doing modern web design. If you are a designer unsure of where or how to spend your time, this is for you. Designing for change is one of the new hurdles of designing for the network. Back when print designers made up the majority of web designers, designs didn’t change after they were delivered. That’s because the practices of print design were carried over to the Web. Print designers are set on a project, they work through it, and deliver what becomes a final printed design. At this point, their work is done and they can go work for another client or on another project. So some web sites created by print designers were set in stone, so to speak, and never touched again. Time has shown, however, that the most successful web sites are the ones that constantly adapt to the needs of their audience. Today’s site is different than tomorrow’s. Chances are that the sites you use the most are ones that change on a regular basis. MySpace, Amazon, CNN, blogs, Boing Boing, etc. All of these sites are different every single day…or even every single hour! It is still the case that interface designers (many of whom decended from print) are brought into a project, asked to create an interface, and then move on to something else. I think that over time this will become less and less the norm. Designers will increasingly be part of the permanent design team, or perhaps hold an advisory role, simply because they need to be around to change their work over time. At the very least, they will have to create interfaces that can be easily modified by others who continue to work on the project after they leave. That leaves designers with the problem of how to create interfaces that are adaptable to change, that can be modified when necessary, that don’t require another complete redesign to fix. That’s a big challenge going forward, and one that continues to creep into conversations I’m having with folks working on web apps. Adam Green’s OPML Camp is slated for May 20th in Cambridge, MA. It looks like a great event, and further solidifies Boston as a burgeoning place for techies. Unfortunately, I can’t go because of family reasons…but I hope everyone has fun. Speaking of OPML, have you shared yours yet? Speaking of sharing, Del.icio.us now has a Don’t Share feature. I’m using it more than I thought I would. The Ugly Design Debate took a turn for the better this past week over on Jason Santa Maria’s site. Jason articulated the argument very well, and the comments stayed civil and enlightening. I particularly like Christopher Fahey’s comment (#53) in which he points out that we’re mostly talking about style preferences (which are as varied as the New England weather). In the end, I don’t think anybody is really arguing for ugly design, but rather for unpretentious design. I used the example of your favorite local diner…none of them are pretty, and that’s partly why we like them. Want AJAX tutorials? Max Kiesler has aggregated a ton of them. Nice! Ryan Carson has a brilliant idea for web apps. Charge more money. Jeff Croft has a great writeup on how he used Django, a Python framework, to build his site. Not everyone is crazy about frameworks, however, as Eric Meyer wrote recently. As a programmer, I can say that if you were migrating toward MVC anyway, then the frameworks coming out now are great and will be an easy switch. If MVC means nothing to you, and you’re not used to building web apps, then you’re probably going to nod alot when reading Eric’s post. I’m happy that he was able to use the word flummox. Finally, Bokardo has a bunch of new readers and I just wanted to say Welcome. I also want to say Thank You to my existing readers. We’re starting to amp up the discussion here, and that’s great. Feel free to drop me a line anytime, and please let me know how I can improve.